In one sense, the termination of the season was a huge relief. For nearly two weeks, there had been a roller coaster of back and forth about ice conditions, logistics, permits, weather and more. The daily anticipation was nerve-wracking so to actually have control over our situation is considerably better than more uncertainty. Now, I am packing up all my gear and putting it in storage for next year, a process I usually really enjoy. But now there is only a feeling of emptiness and this pit of my stomach when I think about the future. It is not so much from not accomplishing our goal of skiing to the North Pole from the 89th parallel, but rather simply not being able to do what I do. I love Arctic Ocean and North Pole expeditions even more that Antarctic adventures. 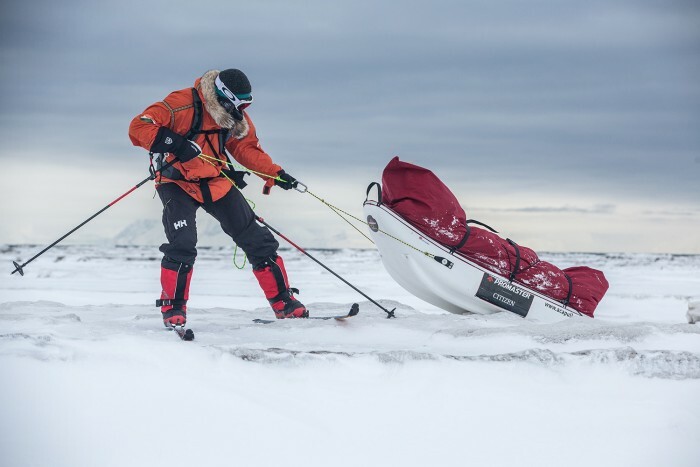 Skiing and navigating on the sea ice is both complex and subtle. To successfully traverse shifting pans, thin ice, wide cracks, pressure ridges requires a level of craft that I have been honing for nearly 20 years now. Mine is a love affair with the ice and the process of traveling through it. And the years of courtship may be coming to an end, but not because I want it to. It's like the North Pole just sat me down and gave me the, 'It's not you. It's me.' speech. In one weird twist of weirdness, I haven't been listening to many of the playlists I downloaded (or made) from Spotify. Instead, I am listening to Hans Zimmer soundtracks from Interstellar and the new(ish now) Blade Runner. I am trying to find the silver lining in all of this and hoping to find some sort of inspiration in this inspirational music. Battling back from one set back after another is not easy. It's like swimming upstream. You can do it. You can make progress but every force of nature is pushing against you. Hesitate for a second and you will go backwards. On a good day, it can wear you out. On a bad day, make you want to give up. It's a lonely and difficult game. There are so many things that I still want to do and my expedition list is ever-growing. But from a business expedition perspective, I continually worry about these 'failures'. This has been a less than ideal winter / polar season for me, starting back in December with warm weather and snow depths that thwarted my South Pole solo ski record. Luckily, nearly all of my sponsors from last year have signed on for another year (with only one exception). I don't like to talk about the 'business' of expeditions and guiding that much but I feel the same gut wrenching anxiety about being able to pull off the yearly balancing act of supporting a family with an 'expedition life' as I do stepping onto a less than stable piece of ice. And now that I think of it, skiing on thin ice is probably more comfortable to me. Equally familiar is picking myself up after I have fallen. I remember one time in 2014, when I climbed up on an ice chunk to take a picture of Ryan skiing. On the way back down, I slipped and crashed hard on my back. My camera flew out of my hands, and in a perfect arc, landed right on my forehead. Both my back and my head hurt so much I initially thought I might have to get evacuated. But with no other option, I got up, brushed the snow off and kept skiing. A month later, we would reach the North Pole in what realistically will be the last ever land to Pole North Pole expedition in history. Life imitates expedition. There is a bit of a sting now, but it will fade. Soon, I will be home and working on the next project and the failure of the North Pole season (like all my other failures) will have passed as well. Of course, you all know this as well. In one last parting apology, I am sorry to take you on the maze of firing (and may times not firing) neurons that make up my thoughts. No one wants to continually read tales of 'woe is me'. That said, my goal with all my adventures has always been to tell the story as it happens. Good and Bad. I am not the guy sitting outside (perfectly positioned) near the tent (without the rain fly on) at sunrise drinking a cup of coffee or petting my golden retriever. And it's not because I don't have a golden retriever, either. These are curated scenes that show an idealized reality, not the every day trenches in which you and I so often camp. My tent is snow covered and crooked. (No one is taken pictures of the tent either, because it's too difficult to bring a camera crew along.) I am inside and shivering. It is cold out - way below zero. And I am waiting until the last moment to go outside because nothing besides my own hard work will keep me moving forward. Image: Up and Over. More Longyearbyen Training.